This necklace has an elegant, geometric pendant that disguises its romantic nature. This necklace from designer Beth Macri is quietly romantic. 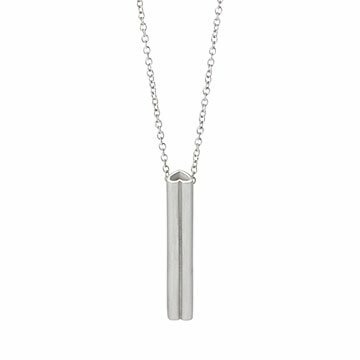 The handcrafted, sterling silver pendant appears to be a simple and elegant geometric form. But lift the end for a different perspective: a heart inspired by an I-beam (a nod to Beth's architectural roots). Filled with love from top to bottom, it's a stylish way to celebrate your love without wearing your heart on your sleeve. Handmade in New York City. Beth Macri brings an unconventional background to her jewelry designs. For eight years, she worked as a structural engineer, building bridges and high-end architecture in New York and London. That practice of transforming two-dimensional designs into three-dimensional reality stayed with her as she shifted into her new medium. But instead of viewing a steel I-beam for its structural soundness, she refocused on the beauty of how it stretches out the flat letter "I" into a unique, new shape. Drawing on that inspiration, she uses letters and symbols to create geometric forms that are both meaningful and structurally beautiful. Use a silver polishing cloth as needed.